The government’s white paper on Industrial Strategy was published today (27 November 2017). 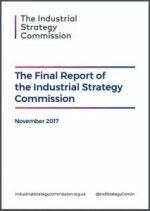 Earlier this month the Industrial Strategy Commission, an independent joint initiative by Policy@Manchester at The University of Manchester and SPERI published its Final Report. Dr Craig Berry, Deputy Director of SPERI, and Professor Richard Jones, SPERI Associate Fellow and Professor of Physics, served as members of the Commission and have given their reaction to the white paper. “This is the strategy Messrs Cameron, Osborne, Clegg and Cable should have devised seven and a half years ago. Nevertheless, we are where we are, Brexit and all, and the May government has done as good a job as we might have hoped for in terms of in terms of identifying the UK’s economic problems, and offering something of a plan for addressing them. “There is much to recommend in the white paper. The emphasis on place is very welcome, particularly the recognition of the distinctive value of local economies, and the bespoke nature of the support required from the centre. The emphasis on infrastructure is a hugely important step forward too, as is the decision to focus on a series of ‘grand challenges’ with the potential to transform living standards and well-being as well as the economy. “On the other hand, there is little new money. BEIS has been among the departments hardest hit by the Whitehall austerity drive, and any industrial strategy will underwhelm while this continues. Some of the new public expenditure being trailed is rather microscopic compared to the size of the challenge, and the plan for unlocking private investment is under-cooked and, frankly, pitiful. “The Industrial Strategy white paper is founded on some good analysis of the problems we currently face – particularly in our productivity problem and our gross regional economic inequalities, it signals some good intentions, and leaves quite a few loose ends. “The commitment to increase the overall R&D intensity of the economy is most welcome, and it’s good to see this aspiration being supported by a plan to develop a more detailed roadmap, in (very necessary) collaboration with the private sector. The Grand Challenges – AI and Data, Future Mobility, Clean Growth and Ageing Society – are well chosen, and there is a welcome recognition of the importance of government in driving the demand for innovation, through schemes such as the Small Business Research Initiative. “We now await the details of how schemes such as the SBRI and the Industrial Challenge Strategy Fund are aligned with the challenges, and how the aspiration to use Government procurement to drive innovation more effectively will be realised in practise. It’s also good to see a candid recognition of the gross regional disparities in economic performance across the UK. Rebalancing infrastructure investments across the country will be an important part of addressing these. It’s good to see the commitment to an improved toolkit for assessing infrastructure investments that takes more account of their potential to make substantial improvements to the productivity of regions. “This would be a big improvement on current practice, which tends to reinforce inequality, and would reflect the recommendations of the Industrial Strategy Commission. The £115m “Strength in Places Fund” will be helpful in addressing the gross imbalances in R&D investment across the country, building on the emerging clusters that the Science and Innovation Audits revealed (for example Sheffield’s Advanced Manufacturing Innovation District, which is highlighted in a case study). But the scale of this fund is not yet equal to the problem and more systemic interventions will be needed.